Hello, my dear. What did the doctor say? I see. Well, doctors don't know everything. Yes, I understand. 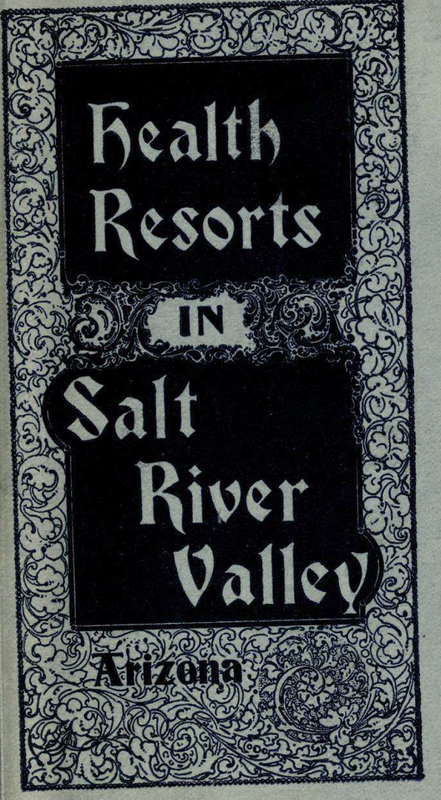 Well, this is 1898, and we're in one of the most modern cities in the world, and... I'm sorry, what were you saying? Well, I didn't become one of the richest men in Pittsburg just to... What? Yes. Yes. Oh, I see. In this imaginary story I'm a wealthy man in a big city back east in 1898 with a very sick wife. She has been coughing, and the doctors really don't know what to do. 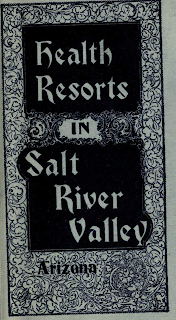 And she has found a pamphlet called "Health Resorts in Salt River, Arizona". Arizona? You mean where the cowboys and Indians are? Way out west? Ten gallon hats and six-shooters? Let me see that pamphlet! You know this is printed by the railroad company? They just want me to buy an expensive ticket... I'm sorry, don't cry, of course I'll read some more. 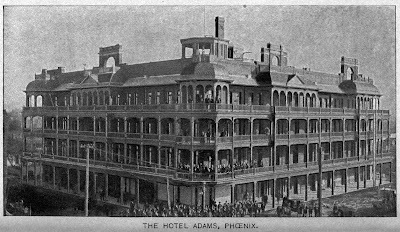 Why, that Adams Hotel looks pretty nice, much bigger than anything I'd ever thought that Phoenix would have. 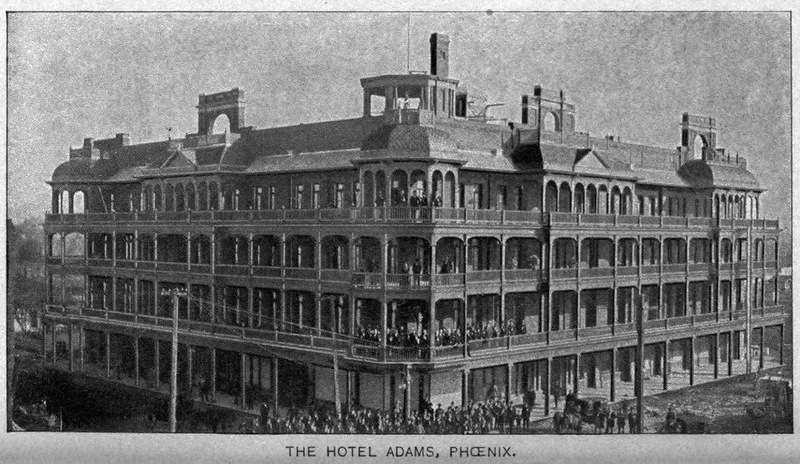 The Adams Hotel in 1898, northeast corner of Central Avenue and Adams, Phoenix, Arizona. Yes, it looks like the Adams Hotel will be fine. I had no idea that Phoenix had anything like that! 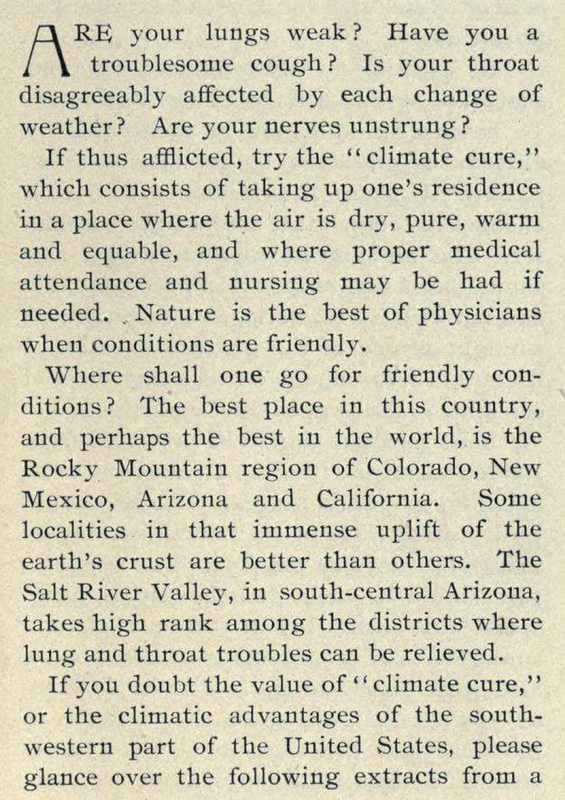 Let's see, according to the booklet, it's called the "climate cure". Sound pretty nice. 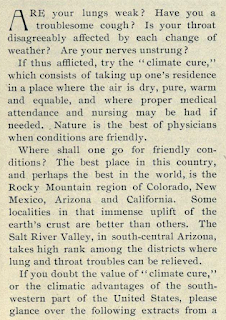 That desert air will have you fixed up in no time. OK, here we are at the station in Phoenix. We sure have a lot of luggage! Yes, of course we can stay as long as you want. I have plenty of good people looking after the business back home. Don't fret. Now just breathe in that clean desert air! You're going to be just fine, I know it. What, are you crying again? Oh, tears of joy, I see. Me? No, I think I just got some dust in my eye. Let's go to the hotel, I'll get you a sarsparilla.